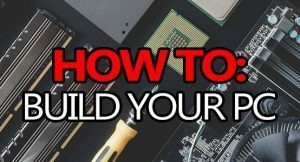 Picking a good PC case can be one of the hardest parts of any build. Not because it’s hard to find a good one, but because there are just so many good options. To (hopefully) make your search a little easier, I’ve put this list together that showcases my top 5 picks for the best mid-tower ATX cases you could get. 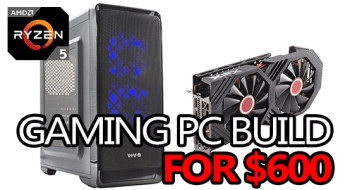 The cases on this list are what I would consider top-tier in terms of price vs performance. That’s to say, this list is not exhaustive and it’s more subjective than anything. Since a big part of picking a case is how it looks (for most people), a case I like might not be the same case that you like. 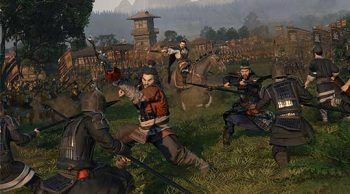 If you have any questions, don’t hesitate to leave a comment! 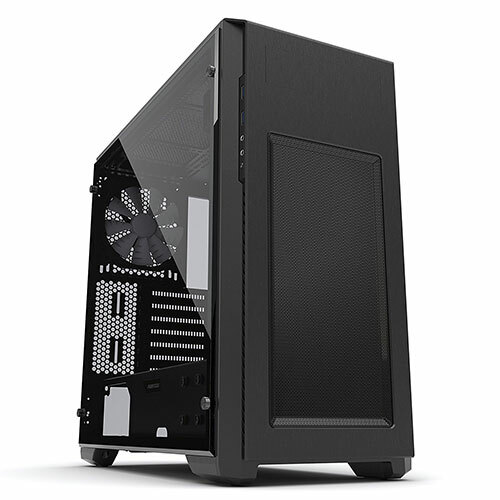 Corsair's Carbide Spec 02 has been my most recommended and most used mid-tower ATX case for a long time - and not without reason. 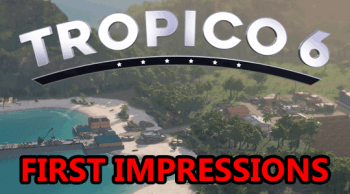 Thousands upon thousands of new builders have started with this case based on my recommendation and I haven't heard a single complaint about it yet. Beyond that, I've personally used it in over a dozen builds and have never had anything to complain about. Not only is the Carbide Spec 02 really easy to build with, but it comes with everything you'll need and won't cost you an arm and a leg. With the Spec 02 you're getting 2x 120mm fans, 1 being lit by red LEDs and the other being a standard black fan. This allows for a good positive airflow setup (considering GPU airflow) right from the get-go which is ideal for most people. However, there's room for another 4 fans and even up to a 240mm radiator for liquid cooling - so you have lots of options. The downsides are few and far between, but they do exist. One of which is the lack of rubber grommets in the cable management slots, but it's not a tremendous issue and won't affect performance. Another downside that's relatively subjective is the placement of the front I/O panel, they're found on the top of the case which some people may not like. All-in-all, Corsair's Carbide Spec 02 is a case you should consider without a doubt. 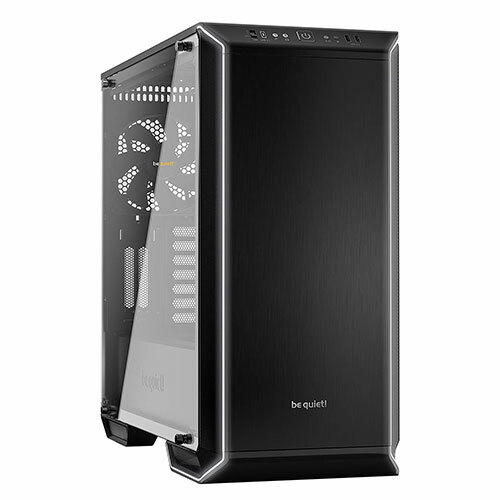 It's a great entry-level option as far as mid-tower ATX cases go and you won't be disappointed. Fractal Design have been making some of the best PC cases you can buy for a long time running. They consistently put out some of the most concise and quietest designed cases out there. Their Define C is absolutely no exception. It's one of the easiest cases to build in, and one of the quietest you can buy, but the trade off is slightly restricted airflow. That said, the Define C comes with 2 of Fractal's 120mm Dynamic X2 GP-12 fans which are quite impressive. Beyond the stock fans, the Define C can easily support a total of 7x 120mm fans, with some spots supporting up to 140mm (front and top). For liquid cooling, you can fit up to a 360mm radiator in the front of the case, up to 240mm on the top, or a 120mm in the rear. There are 2 versions of the Define C available. The pictured version that comes with a sound-padded side panel, and a windowed side panel version. 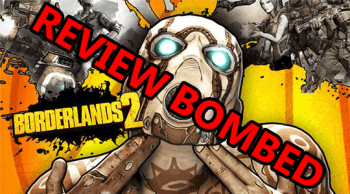 The windowed model is a bit lighter, a little noisier (hardly noticeable), and works to show off your hardware much better. 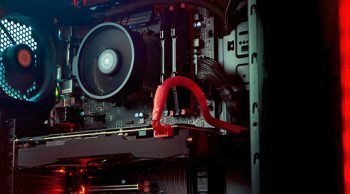 So, if you're trying to build a silent PC that boasts a minimalist design without spending an insane amount of cash, the Define C should not be overlooked. Phanteks has a reputation of making some of the most aesthetically pleasing cases out there. Out of their most recent cases, I can't even think of one that hasn't looked great without being excessive. Not only do their cases look good, but they generally perform well too. Enter the Pro M (with Tempered glass). Not only does it look great (IMO) but it performs well to boot - just what you'd expect from a Phanteks case. If you're familiar with the older Enthoo Pro M, this is just the newest iteration of it. It's boasting a huge tempered glass side panel and features a clean layout that lends itself to great cable management. The (nearly) full PSU shroud covers everything but the side of your power supply, just to make your build that much cleaner. It's also featuring a side-mounted front I/O panel (perfect for on-desk setups) and great overall airflow. It's also one of the few modern cases to feature a 5.25" ODD bay. Out of the box, the Pro M comes with 2x 140mm fans. It also offers great support for liquid cooling setups by giving you dedicated reservoir mounts and super easy installation of radiators. Phantek's Pro M is undeniably a great looking case with a good list of features. The price might be a little steep, but you're paying for (and getting) quality. The H500 is one of NZXT's newest, and probably one of their best cases they've released to date. It's effectively the successor of the S340 and offers a few notable improvements. NZXT nailed it with this case and it serves as a great successor to the S340. Any complaint you might have had about the S340 has probably been fixed and the H500 even offers more value considering it comes with a tempered glass side panel for the same cost as the S340 and its acrylic side panel. Something seemingly strange about this case is the default fan configuration. NZXT decided to go for 100% negative air pressure and opted to run both 120mm fans as exhaust. Although this might seem strange, it actually works quite well - even better if you remove the top air filter. But, if you live in an especially dusty area, or with lots of pets, you might want to rearrange this to a neutral or positive air pressure to reduce the amount of dust getting sucked into your case. The H500 gets the #2 spot on this list for a few good reasons. Not because it cools the best, is the quietest, or because it offers the best features. Nope. 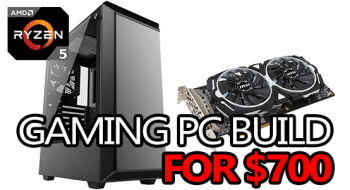 It gets the #2 spot for being an exceptionally high-quality case with an extremely good price - definitely worth checking out, especially if you're a fan of the S340. 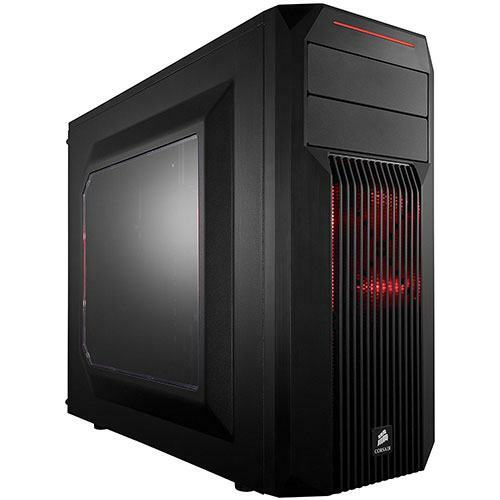 There's also a slightly more upgraded version dubbed the H500i that includes a smart panel and RGB lighting, just in case you want those features. The Dark Base 700 from be quiet! is undeniably one of, if not the best mid-tower ATX case you can buy. 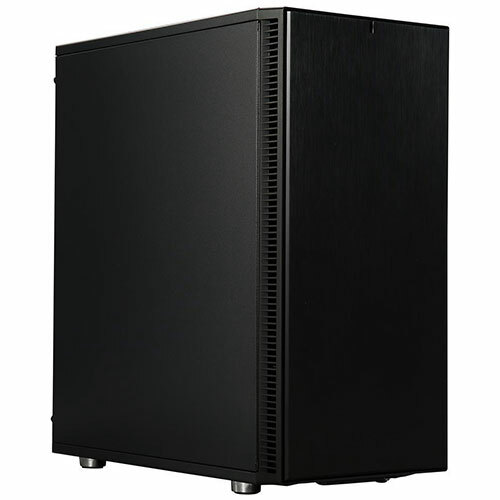 It features everything you could need in a case, including a removable fan/radiator tray (for ease of installation), a dual rail fan hub, and an ingenious PSU shroud with detachable plates. The front I/O even contains a USB 3.1 Type C Gen 2, a feature not commonly seen on front I/O panels. 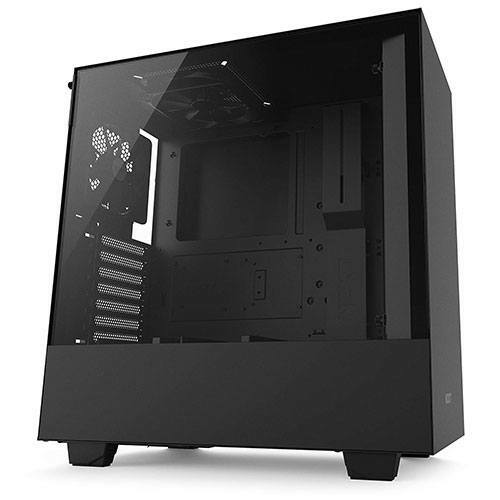 The Dark Base 700 also features a big tempered glass side panel to show off your parts. It comes equipped with 2 of be quiet! 's 140mm Silent Wings 3 fans that are practically inaudible, even when cranked up to their 1600RPM performance mode. The exterior of the case is accented by vivid RGB LEDs that can be toggled through 6 switchable colors or 3 preset modes. Beyond that, these RGB LEDs can also sync up with your motherboard or an RGB controller for complete continuity. At the end of the day, the Dark Base 700 is simply one of the best choices you could make, as long as the price point doesn't scare you away. Otherwise, buying this case is a no-brainer. Whether you’re looking for a completely silent case, or one that just looks good, I’m sure you were able to find it on this list. Keep in mind that most cases have multiple color options for the chassis, so be sure to check for that if you’re not a fan of the pictured color scheme! From the Corsair Spec 02 all the way up to the amazing be quiet! Dark Base 700, this list is by no means exhaustive. The amount of cases out there is seriously astronomical and this list could have easily been top 50 as it was top 5. That being said, since there are simply so many good cases, I have to make some honorable mentions. 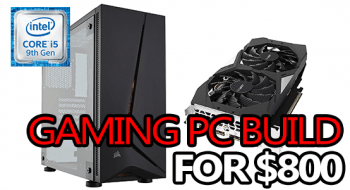 That’s it for my list of the top 5 best mid-tower ATX PC cases! If you felt that a really amazing case wasn’t mentioned that should have been, let me know in the comment section below! 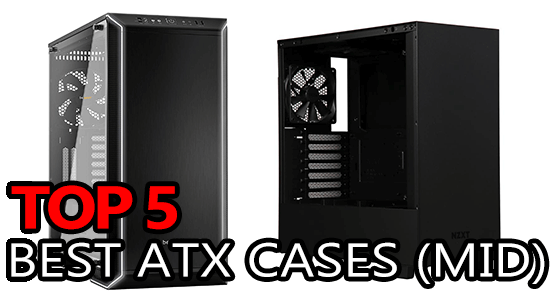 Just keep in mind, these were only mid-tower ATX cases; here’s our top 5 best mATX cases. If i currently have an S340, is it worth buying the H500 as an upgrade?